THE most inspirational Northern Beaches Cycling Club ride did not involve a podium finish, but the rise of rider Kylie Anticich in Rockingham on the weekend. Anticich, at 48 years old, entered racing events for the first time less than two years ago. 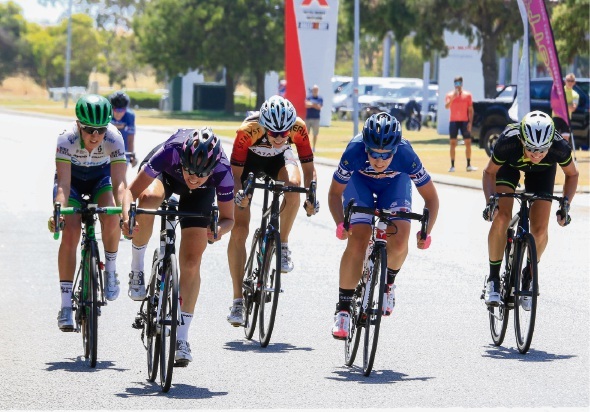 Anticich not only competed in the Elite A-grade women’s race, but pushed the field in a sprint finish, missing a podium placing by inches in the Ring Criterium series event hosted by Peel District Cycle Club. The class field featured the likes of Melissa Robinson (first), rising star Emily Mascaro (second) and Orica-Scott rider Jessica Allen (third). In D grade, Catherine Zainudin impressed on debut with a win, while fellow debutant Georgia Sullivan-Brown finished fifth. As the wind picked up in the men’s D grade race, Northern Beaches’ Richard Reeves kept a close eye on Champions Lake rider and series leader Nicholas Tan. In the last lap, Reeves positioned himself well and with 150 metres to go, held off the field to win the sprint. The win puts Reeves into the series lead. In C grade, Jethro Nagle timed his run to the line with near perfection to claim second behind Sam Nikora. Masters racing was held at Herne Hill. Edward Rose finished second in E grade and Peter Hunt claimed third in C grade. Mark Welford continued his winning form, sprinting from the rear of a 30-man strong B Grade peloton to take the win. The podiums further extended NBCC’s lead in the team series.